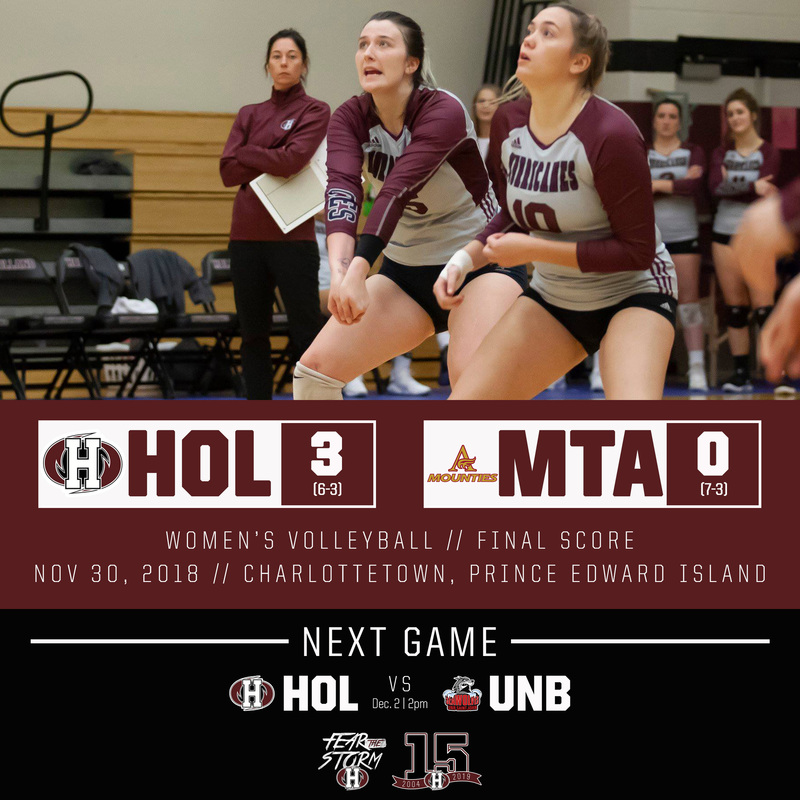 The Holland Hurricanes women’s volleyball team picked up a pair of big wins over the weekend against the Mount Allison Mounties and UNBSJ Seawolves, while the men dropped a five-setter on Sunday versus the Seawolves. On Friday night versus the Mounties at the Holland College Centre for Community Engagement, the women’s Hurricanes won by set scores of 25-18, 26-24 and 25-22. Abby Hyndman had a match-high 19 kills to lead the attack for the ‘Canes with Taylor Allen and Brittany States both adding eight. Laura Ready had a match-high 39 assists while Hyndman and Zayley Murphy led the way in digs with 11 and ten respectively in the win. As a team, the ‘Canes had 12 aces, with Philicia Johnson recording four and both Hyndman and Murphy each adding three. The Mounties dropped to 7-3 on the season following Friday night’s loss. On Sunday versus the Seawolves, the ‘Canes took a 2-1 lead by set scores of 25-22, 20-25 and 25-18, before an epic marathon of a fourth set. Trailing 24-20, the Hurricanes scored five straight points to set up match point. From then however, the ‘Canes and Seawolves traded blows and neither team got ahead by the required two points. The set, and match, finally ended after a kill by Laura Ready gave the ‘Canes a 43-41 set win. The Seawolves had 13 set points including four-in-a-row from 24-20 to 24-23, while the ‘Canes converted their ninth match point. Hyndman again led the attack for the ‘Canes, this time with 18 kills while both States and Murphy reached double-digits with 14 and 11 respectively. States added four digs and four blocks. Laura Ready had 48 assists in the match, second most in a match all-time for the women’s volleyball Hurricanes, while Katie Wood led an excellent team defensive effort with 23 digs. Murphy and Allen both had 15 digs in the win while Ready had 14 and Hyndman recorded 11. The ‘Canes move to 7-3 on the season after the two victories and are now tied with the Mounties for second place in the ACAA standings. The Seawolves drop to 6-4 with Sunday’s loss. After her performances this weekend, Brittany States becomes the new all-time leader for career kills by a Hurricanes women’s volleyball player; she reached 441 career kills, passing the previous record holder, Megan LeBlanc, who had 420. In the men’s game on Sunday, the ‘Canes jumped out to a 2-0 lead before dropping the next three sets and the match. Set scores were 17-25, 17-25, 25-22, 25-22 and 16-14 for the Seawolves. Brett Butler led the Hurricanes attack with 19 kills while Riley O’Keefe and Jeff MacDonald added 11 and ten respectively. 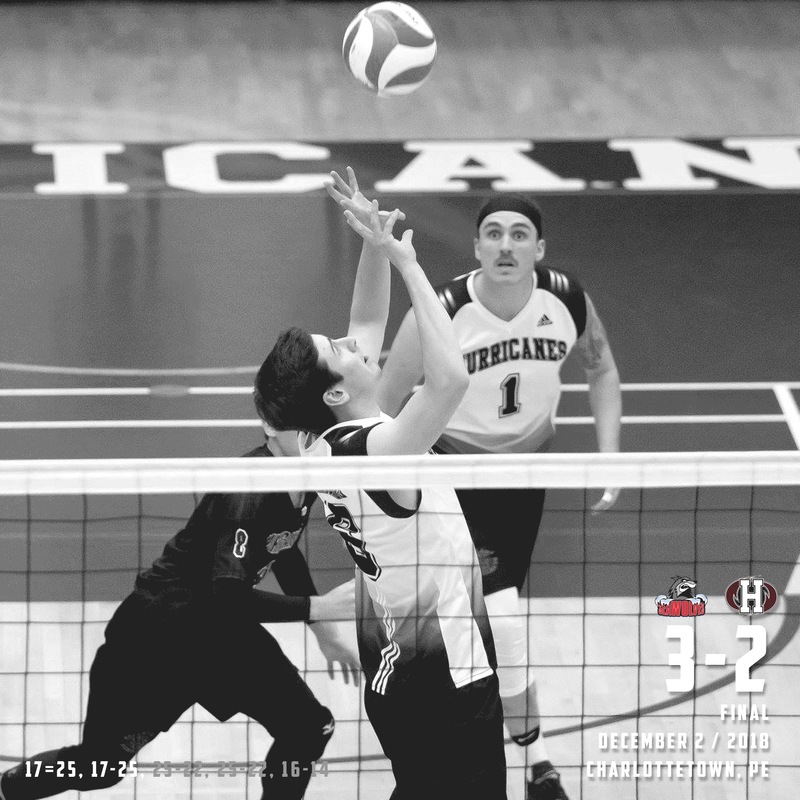 Nicholas Menzies had 44 assists in the match while Marcus Lapointe and Butler had 25 and 22 digs respectively in the loss. With the loss, the ‘Canes fall to 2-5 on the season and continue to sit in third place in the ACAA standings; the Seawolves improve to 4-3 and remain in second. At this point in the regular season, Brett Butler leads the ACAA in aces (22), kills (97) and points (130.5), while Nicholas Menzies sits atop the conference in total assists (234). The Hurricanes will resume their regular season schedules in 2019 when they return to the court on January 12. The women will host the Université de Sainte-Anne Dragons while the men will travel to Saint John, New Brunswick to take on the Seawolves. For full stats and standings on the Hurricanes regular seasons to-date, visit www.acaa.ca.